CTV reported this week on the dangers of Pradaxa, as news broke of the first Canadian family to sue the drug’s makers. On the market in Canada since 2008, this blood-thinning medication has no known antidote and ER doctors in the US have been sounding alarm bells for some time. Dr W Gifford-Jones wrote an article mentioning Pradaxa in the Toronto Sun last March. It generated a scathing reply from Scott Sawler of Health Canada’s NHPD, which is still available to view on Health Canada’s website. …why are natural remedies being removed from health food stores while drugs that kill remain available? Rona described a New York Times report showing the U.S. government’s primary suspect in 542 deaths was Pradaxa, a blood thinning agent. Moreover, when this drug causes bleeding, there is no antidote to stop it. Health Canada issued an advisory in December based on new information that it’s not to be used in patients with artificial heart valves. However, it has not removed Pradaxa from the market. It has removed a competitor, the soy-derived enzyme Nattokinase, a safe, effective, natural blood thinner that has not harmed anyone and has been used for centuries in Japan. Since blood thinners carry a risk of internal bleeding, their health benefits must outweigh this risk. Clearly the ‘risk’ only matters for a natural product with zero deaths on its record. We have submitted Access to Information requests to Health Canada for the number of deaths linked to all natural health products…there are none. According to the Health Canada Adverse Drug Reaction database, there have been more than 1,700 adverse reaction reports and 281 deaths linked to Pradaxa from the time the drug was approved for use in this country in 2008 up until December 2013. We can only conclude that Health Canada’s definition of ‘risk’ is different for pharmaceuticals. NHPPA has submitted a News Item on CTV’s contact form (provided for you below) that asks to have Avis Favaro Medical Specialist, and CTV National News and producer, Elizabeth St. Philip follow up this story with a report on Nattokinase. 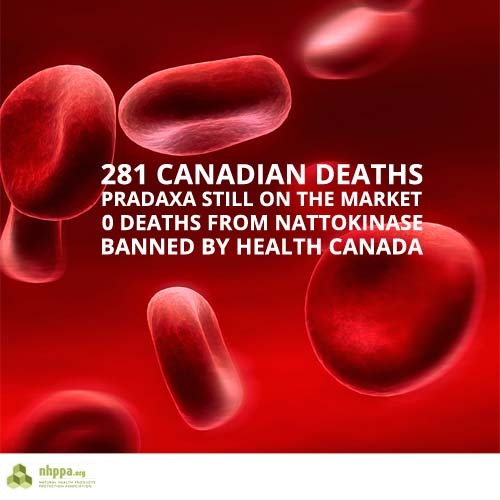 We think the CTV should ask Health Canada about the ban on Nattokinase. If you would like the national news to shine a light on what is happening to natural health products, now is the time to get in touch. Either go to CTV’s Newsbreaker Page and use their form to tell them this is a news story that Canadians need to know about or email CTV’s Medical Report.